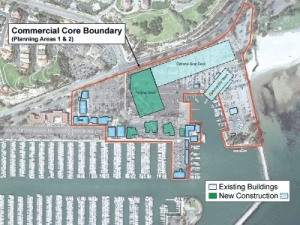 DANA POINT—A boater’s advocate group has submitted an appeal to halt progress on the Dana Point Planning Commission’s approval of the Coastal Development Permit (CDP) application for the Dana Point Harbor Revitalization Plan. Claiming the commission’s 4-1 approval failed to focus on ensuring provisions of the Local Coastal Program (LCP) were met by the county’s CPD application, Boaters 4 Dana Point Harbor filed the appeal with the city, May 27. The accepted measure passed the Commercial Core portion of the project, which will add approximately 35,000 square feet of retail, commercial, and office space in the area. The vote also called for a dry stack boat storage building known as “the boat barn.” The appeal could potentially delay progress. Heyman, though, said the additional loss of dry boat storage in the harbor will be detrimental to boaters. While the CDP for the conceptualized boat barn won’t be pursued for another three years, construction for the Commercial Core is scheduled to begin during the first quarter of 2015. City officials said the boat barn is necessary to preserve the Coastal Commission’s requirement that space be available for 493 dry storage boats. The boat barn has an estimated cost of $32 million, and Heyman said, prior to revitalization, the number of available dry boat storage in Dana Point Harbor is 684. The city’s proposal of 493 spaces is roughly a 25 percent loss. James Lenthall, vice-president of the Dana Point Boater’s Association, said his group was disappointed that commissioners failed to attach conditions to the building permits of the Coastal Development permits. Lenthall said that, while an appeal by someone was inevitable, it’s a moot point. “I don’t believe an appeal is necessarily a wise move on behalf of boaters, because it’s very clear the vast majority of boaters in Dana Point support revitalization, even on the commercial side,” he said. Lenthall said expenses, impracticalities pertaining to use and the transformation in relationship between the boaters and their boat were all concerns expressed to the Planning Commission. During the hearing, Heyman handed out a packet to each commission member, which addressed his organization’s main parking concerns with the CDP, including availability during construction, net loss of slips and anchorage limitations. The highly-contested boat barn must still pass a vote by the California Coastal Commission. “We’ll just have to deal with the Coastal Commission on that,” Heyman said.